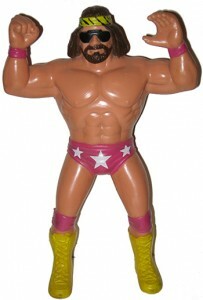 Home » Features » LJN WWF Wrestling Superstars Figures – The Best Wrestling Toys Ever? 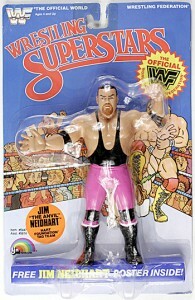 LJN WWF Wrestling Superstars Figures – The Best Wrestling Toys Ever? Great toys demand to be played with. Look at almost every LJN WWF Superstars figure released between 1984 and 1989 and you'll notice something common among nearly all that survived -- they've got lots of playtime evidence. 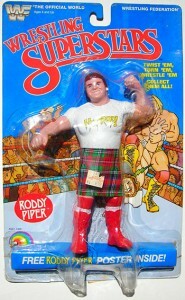 One of the most popular products during the WWF's massive growth, these wrestling figures bucked a lot of the action figure trends at the time. Shop for LJN WWF Wrestling Figures on eBay. While Star Wars and G.I. Joe led the charge for small action figures, LJN's wrestling figures went big. Standing about eight-inches high, they're about twice the size of the average G.I. Joe figure from the time. Also, most action figures could bend and came with a growing number of accessories. LJN WWF Wrestling Superstars are as stiff as a King Kong Bundy punch. Most figures came without accessories save for maybe a hat or cane. Basically, these are inaction figures. 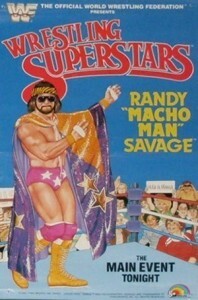 Yet the LJN WWF figures were wildly popular at the time. Now they can be very collectible as grown adults get nostalgic for a time when Hulkamania meant something. Despite their shortcomings in the articulation department, these wrestling figures were actually a lot of fun to play with. LJN did an excellent job of capturing the likenesses of the wrestlers and WWF personalities. They might not have the same level of detail as today's McFarlane figures or those put out today by Mattel, but it's still easy to tell who the wrestlers are. Figures came packaged with small posters. These were rolled up and stored in the base of the packaging. Also, the packages had a file card on the back, similar to those found on G.I. Joe figures from the same period. Many people collect these today as well. Today, LJN WWF figures can command big money on the secondary market, particularly for unopened mint figures. Some of the most valuable figures came at the end of the line's run, which is often the case for figures and toys as the decreased popularity means smaller print runs. The final series came out in 1989. They were actually made by Grand Toy in Canada and not LJN. The figures switched to a new black card and were a mix of a few new figures and several repackaged wrestlers from earlier lines. These black cards are much tougher to find than figures from previous series. As a result, they are generally much more expensive than those WWF figures found in other series. By their very nature, LJN WWF figures were played with hard. Understandably, paint wear is a very common trait among the toys. This limits the value a lot of these figures might otherwise have. 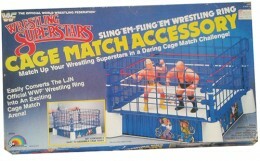 Besides the figures, LJN also released the Sling 'Em-Fling 'Em wrestling ring and a Cage Match Accessory add-on. Below is a checklist of all the LJN WWF Wrestling Superstars figures released between 1984 and 1989. You can shop for specific wrestlers by clicking on their names. Each tag team set came packaged with two figures and a pair of brown belts. If you know of any others, please let us know in the comments below. 1986 WWF Wrestling LJN Titan Sports Corporal Kirchner Action Figure 8"
1986 WWF Wrestling LJN Titan Sports Ricky The Dragon Steamboat Action Figure 8"
i have a PAUL ORNDOFF with hogan card on back is there more of them? A guy brought me 30 carded LJNs at a toy show in Orlando 1998. Among them was Harley Race and a black carded Jake the Snake Roberts. They had been sitting in a pawn shop. I got an instant collection. i have a ted dibiase ljn in the package but ‘it’s a mistake cause the cardboard and poster read mr fuji. it’s not been altered or anything. is it worth much? The Strike Force tag team set came with black championship belts. Great list. My husband has well over 40 of these posters. Still rolled never opened are they worth anything? He’s been saving since he was a kid. I do believe that Adrian Adonis has an 1989 black card reissue. 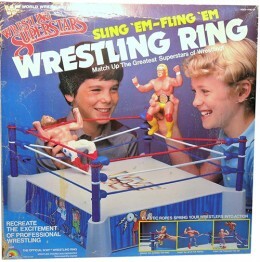 As the top Google listing, you should be careful to point out that the Fling-em-Sling-em Ring was recalled because too many kids got impaled by the ring posts… I don’t know how many is too many, but just one punctured organ would be enough for me to put out a serious warning to would-be collectors. That said, anyone got a ring to sell me? i am missing ksamal the kiler bees tag team the hart foundation/bam bam bigelow one man gang million dollar man /hacksaw jimduggan demolition ax /ultimate warror jake the snake roberts/mr.fuji.haku ravishing rick rude/big boss man with night stickhulk hogan with white shirt honky tonk man /refferee llucious jhonny valaiant i do not have a job to buy any loose figures with posters i collected quite a few in the late 1980s.for birthdays and christmases.do you know where can find these figures.thank you. Brutus Beefcake, Adrian Adonis, Big John Studd and Ted Dibiase all had black card re-issues. I have a Jake with a black Damein. I have looked online and have never seen another black snake. Where is the Smash figure. I remember on the back of the Black label package. It showed Smash was one of the new figures. Where is the Smash figure? I remember when I bought Rick Rude they showed all the new figures coming out with the new Black line But some of the figures didn’t seem to get released like both Powers Of Pain etc. @Zorromendez on Instagram has just about every figure ever made for sale. His name is Zorro Mendez. 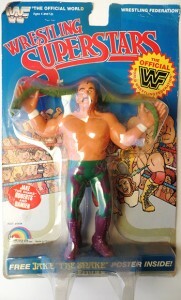 Ive been looking and cant find 1 specific ljn figure i had to save upcs and mail away for it was a hulk hogan in his no holds barred rip it white tshirt. But cant find any history of it anywhere and am positive i had it as a kid. WWF LJN WRESTLING SUPERSTARS ONE MAN GANG Figure WWE MOC W ACRYLIC CASE. WWF LJN Wrestling Superstars MOC - Honky Tonk Man Rare!